EH? Is George Clooney Planning to Retire? The actor says he's too old for Hollywood. Yeah, right. 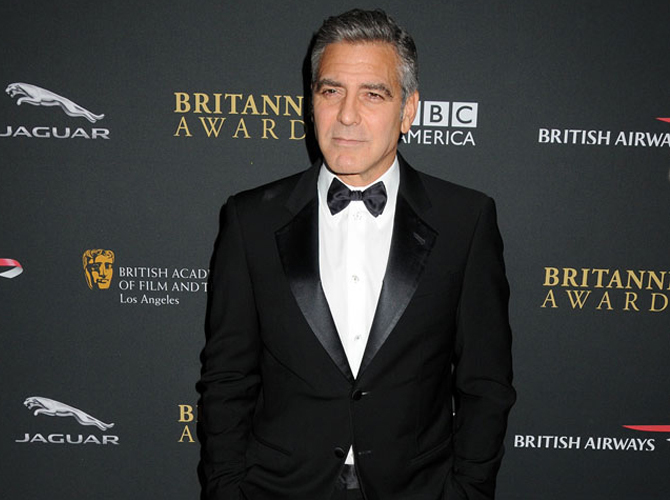 George Clooney thinks he's getting too old for acting. The 52-year-old star has hinted he is thinking about retiring from the big screen in the near future to focus on his work as a producer and director. The Monuments Men actor, who also wrote and directed the film, told BANG Showbiz at the movie's UK premiere at the Odeon in London's Leicester Square: "The audience kind of tells you when it's time to get out from in front of the camera, and it's getting close I think." But George insisted he is still very passionate about his career. He said: "Every time you can make a movie to tell a story that people don't know, it's good." The Oscar-winning actor also joked about how difficult it was to work with his co-star Matt Damon, who also attended the red carpet screening, on the movie, which is based on the true story of a team of soldiers who recovered millions of pieces of artwork stolen by the Nazis in WWII. He said: "It was hard to get him out of his trailer sometimes. I don't like to use the word diva and throw it around loosely, but you know." But George admitted he loves working with close friends and they inspired the characters. Asked about securing the star-studded cast, he said: "Most of these guys are friends of mine so that made it easier, but we wrote the parts for most of them." Bill Murray, John Goodman, Jean Dujardin, and Hugh Bonneville were among the other stars to attend the premiere.